Open or solid web rafters, trusses or purlins can be easily insulated with ThermoShield / ProCell insulation. Whether the roof is flat or sloped ThermoShield / ProCell insulation is a more cost effective way to insulate compared to batt and roll systems. With a high 3.8/in. R-Value (0.263/mm RSI), ThermoShield / ProCell maximizes protection against sliding ice hazards and condensation problems which commonly occurs in fiber glass blanket systems. Material is kept in place through the use of a rugged polyethylene woven fabric which fastened to the underside of roofing members through the use of a metal strapping system. Finished ceilings eliminate the unsightly appearance of exposed framing members as well as provide superior vapour barrier protection. The versatility of blown-in ThermoShield / ProCell allows it to be used in either stressed skin, sandwich wall construction or cold-formed steel stud framing. 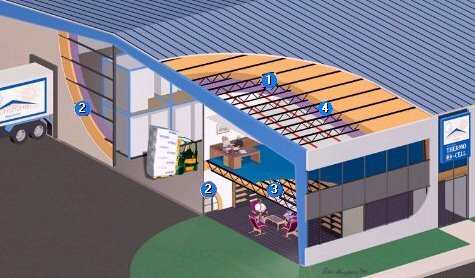 So whether your building is designed for use as commercial, office or warehouse space, ThermoShield / ProCell will meet all your needs. Walls can be insulated from the inside by blowing through netting, woven polyethylene fabric or by holes drilled through the liner. 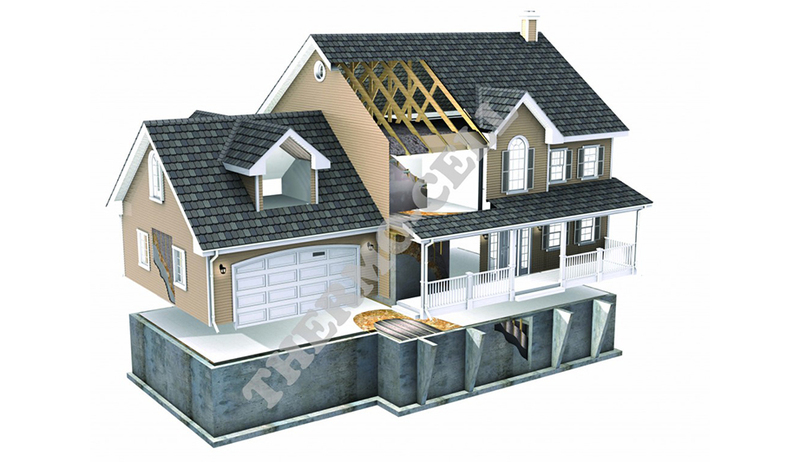 By insulating from the interior of the building costs overruns due to down time and material loses from bad weather (i.e. snow, wind and rain) are minimized. Additionally, the safety of the workers installing the insulation is improved which will result in higher productivity and a better quality insulation job. Installed at a density 3 times greater than glass fiber batts and rolls ThermoShield / ProCell not only offers superior thermal resistance but unsurpassed resistance to air leakage and convective heat losses associated with gaps and voids. ThermoShield / ProCell’s high density characteristics also make it a preferred choice for sound control. Today many heavy industries are located in areas where there are noise level restrictions. By using ThermoShield / ProCell over other insulations excessive noise generated by heavy industrial equipment can be effectively reduced to levels below 50dB. Insulating floors is often required for sound control between floor of office buildings. ThermoShield / ProCells unique ability to absorb office and manufacturing based sounds is unsurpassed. In recent testing at the National Research Council of Canada it has been demonstrated that 3 ½” (90mm) of blown-in ThermoShield / ProCell Insulation provides the equivalent level of sound control (STC 51) as 5.5″ (140mm) rock wool and 6″ (152mm) glass fiber batts. This benefit can translate into a cost savings of up to 35% or conversely a higher level of performance at the same cost.